Prof. Cinner’s research explores how socio-economic factors influence the ways in which people use, perceive, and govern natural resources, with a specific focus on coral reef social-ecological systems. Josh began working on human dimensions of marine conservation while serving as a Peace Corps Volunteer in Jamaica in the mid 1990s. He has since completed a Master’s degree from the University of Rhode Island and a PhD from James Cook University. 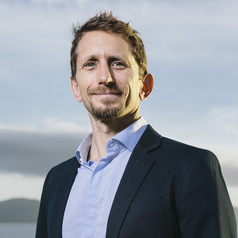 He currently holds a Pew Fellowship in Marine Conservation and is a Professor at the Australian Research Council’s Centre of Excellence for Coral Reef Studies in Townsville, Australia. He has worked on human dimensions of marine conservation in Jamaica, Mexico, Papua New Guinea, Kenya, Madagascar, Tanzania, Mauritius, Seychelles, and Indonesia, and the USA.